I dead headed the first round of white daisies this evening, and took note that as the first flowers of spring start to fade, the colors of the garden are migrating from purples, violets, pinks and whites to yellows and golds and other richer colors. I didn’t plan it that way, that’s just the way it is working out. Pictured here is just one of several yellow flowers blooming now. It is False Sunflower, Heliopsis helianthoides. It’s a carefree, easy plant, and is a native wildflower of the prairies. I started mine from seed in 1999 and they are going strong. 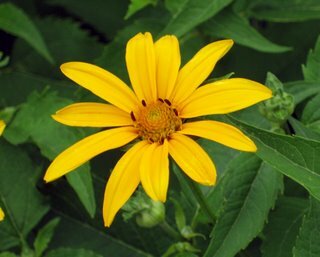 I also have the variegated variety of False Sunflower, called ‘Loraine Sunshine’, which I purchased around the same time (1999) for $15. I clearly remember it because that is the most I had ever spent on a perennial (and still is probably the most expensive perennial I have). It doesn’t get as tall as this one pictured, which can grow up to 4 to 5 feet. Both of these False Sunflowers self sow, so you have to watch for rogue seedlings and be willing to pull them out in the spring so there is not complete madness and competition by mid-summer! I speak from experience, trust me! Other yellow flowers in bloom now include daylilies, (‘Stella De Oro’, of course), coreopsis (Coreopsis lanceolata), and some yellow daisies someone gave me, which I don’t know the name of. I didn’t spend a lot of time in the vegetable garden after work today, partly because I was busy mowing the lawn, partly because I didn’t want to look at the beans (what's left of them) more than I had to. Such destruction! The good news is that “so far” the rabbits haven’t found the pole beans. I am hoping those beans will start climbing up the poles and out of reach of the rabbits before they do find them! I plan to go back to the vegetable garden tomorrow after work, weed all the beds, sow some more corn and beans, and then fertilize it all. I will once again cover the seed beds with white garden cloth, for as long as I can, and hope for the best. Not much of a plan, but that's all I've got in mind to do right now.